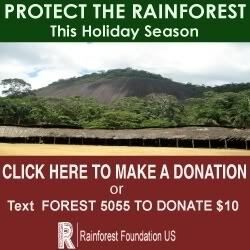 Protect the rainforest this holiday season. * Donating protects 5 acres. 5 acres produces 100,000 gallons of fresh water in one year - the amount of water used by the average American over 3 years. * Donating protects 10 acres. 10 acres of rainforest produces 28 tons of Oxygen in one year - the amount of Oxygen breathed in by 8 people in a year. * Donating 0 protects 20 acres. 20 acres of rainforest absorbs 80 tons of CO2 in a year - the amount of CO2 emitted from burning 8,000 gallons of gas! There is no more important gift you could give this season. And when you make a Holiday Gift donation we will send you a special certificate in recognition of the acres you are protecting.